It’s hard to believe how quickly the summer has flown by! I’ve been home just two days in the past month or so, and Cam and I counted 11 states I’ve visited since the school year ended. Most of my travels were for work, but I did find time to enjoy 10 days in Michigan, where we rented a cottage on Lake Charlevoix. As much as I’d hoped the Internet connection would be strong as I planned the trip to include some work, it was kind of a relief when it turned out that the best connection was made on the dock/deck lakeside! While I still have hundreds of photos to edit from my travels, I did finally manage to sit down today and spend some time in Lightroom between editing magazine articles. One of the highlights of my journey was an evening I spent with Ryan, Kaleigh and their dog, Rocky. As they prepare for their upcoming wedding, they decided to add some family photos to their engagement collection. 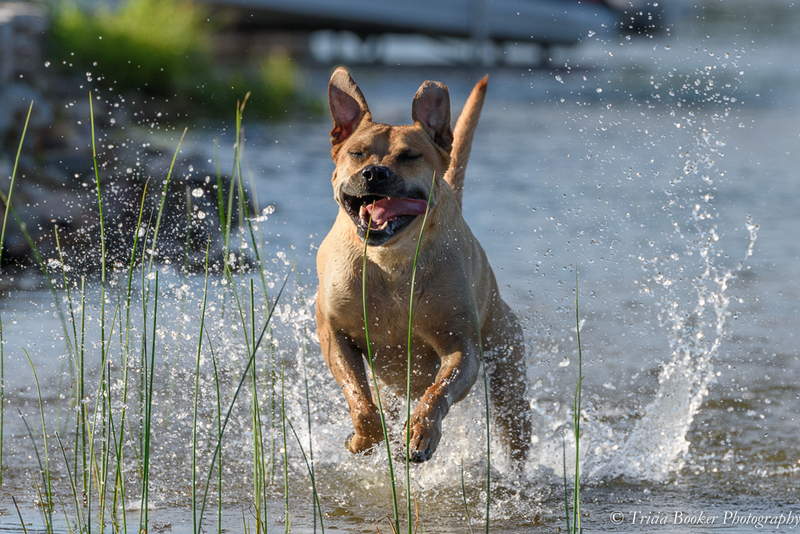 They asked me to meet them at a nearby lake to photograph Rocky as he experienced the water for the first time. It was a blast to see Rocky take his first swim and even enjoy a kayak ride with his dad. Capturing his incredible smile was so much fun! Nothing more wonderful than a dog at play! Beautiful shots. Yes, I agree! Love to photograph the dogs. Thank you so much! Hello fellow traveler – we’re keeping a similar schedule, more on the road than at home. I must say, however, I don’t mind much being horse show season. I’d say Rocky really enjoys the water. When I had a dog, growing up, he didn’t particularly care for a bath or walking/running near the water sprinkler. But, he didn’t mind the rain all that much. Hi David! Yes, the horse show season is a busy time for all of us. My dog likes the water as long as she’s in control and it’s muddy. She will go out of her way to roll in a dirty mud puddle but a clean pool isn’t nearly as fun, evidently! Trish, these are awesome pictures of Rocky. You have captured his fun filled nature and obvious love of water!! You are the best….thanks a million! !